This February, Image Comics invites readers to jump on board action and adventure, newly reinvigorated with a very special adjective – THE UNCANNY SKULLKICKERS! 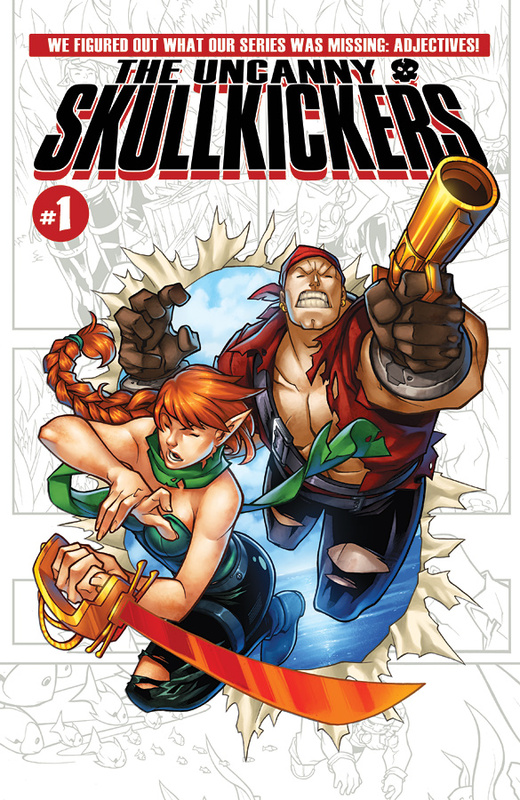 UNCANNY SKULLKICKERS, written by Jim Zub and drawn by adorable elf-man Edwin Huang, begins the second half of the epic six-arc SKULLKICKERS storyline and is a perfect jumping-on point for new readers of the action-comedy fantasy series. And who doesn't want to be known as a reader of a comic about hard-headed mercenaries knocking heads for fun and profit? I mean, really. And if you're a diehard collector of SKULLKICKERS who's sad that you won't have a SKULLKICKERS #19 to add to your collection? Don't worry, we've thought of everything. In addition to the regular "Uncanny” cover we're offering a special "issue #19 variant” B cover to make sure your collector streak is unbroken. It's new. It's classic. It's a modern reinterpretation that gets back to the roots of these timeless characters. This looks great. Where do I get one?